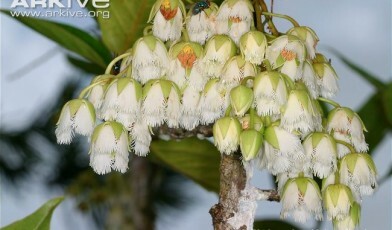 Elaeocarpus bojeri is a flowering tree from the family, Elaeocarpaceae. The species synonym, Bois Dentell, means Lace Wood in English, a name derived from its delicate white flowers. When first flowering the species forms delicate white flowers which have fringed edges that form a bell like shape, which slowly fade once the plant has been pollinated; flowering occurs between July and September. The height of the species ranges from 5m up to 12m. The plant requires constant moist conditions but not necessarily an awful lot of rainfall, in terms of sunlight medium exposure is optimal. The species is most commonly known because of the well publicised fact that there are only two individuals left of the species in the wild, earning the species a place on ‘The World’s 100 Most Threatened Species’ list. Elaeocarpus bojeri is native to the Mauritius Cloud Forest and only found in one place within it, the hills of Piton Grand Bassin. The species was thought to be extinct until the two specimens were found. E. bojeri faces two key issues, the first being the vulnerability of its native habitat. Cloud forests are in decline around the world with an estimated 1.1% of their cover lost each year, and the Mauritius Cloud Forests are no exception. Cloud forests are vulnerable to climate change as they are a very finely balanced ecosystem especially in terms of hydrology. Further issues also include the conversion of habitat to agriculture or pasture. Both of these elements have shrunk the natural habitat of Elaeocarpus bojeri. The other main factor affecting the species is the encroachment of invasive and more economically viable species. Action has been taken by the Mauritian government and Wildlife foundation, seeing the successful cultivation of several saplings. This species is reported as held in 10 ex-situ collections.